Design critique is a tenet of any good design practice. Critique helps us gather diverse perspectives on our work, strengthen our craft, push ideas forward, and ultimately get better results. 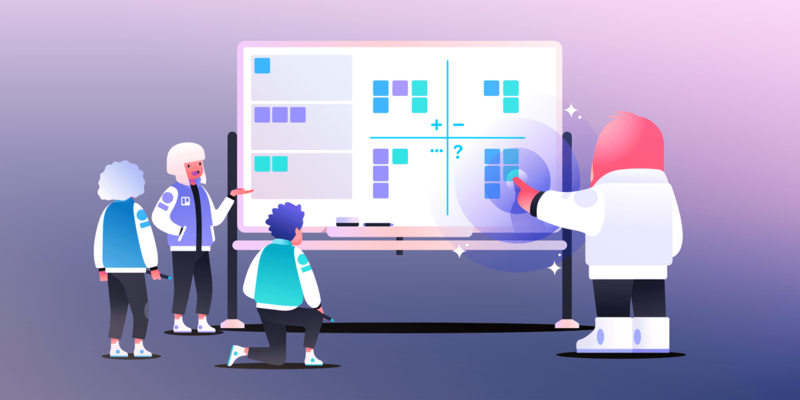 And as new teams emerge at Trello and our design team grows, it’s all the more critical that we have a process for spotting inconsistencies and building on each others’ work. Critique is also deeply cultural for any design team. The way a team discusses design can set the tone for collaboration and relationships. As such, the Trello design team has developed our own format for design critique, which we call Huddles. We’ve developed Huddles with great intention, to ensure that they suit our remote context and mitigate some of the pitfalls we humans fall into when we get together and talk. We also think that Huddles aren’t just for design teams! They can be a great experience for any crew who collaborates to help break down biases and create better feedback loops. Here’s some history on how we started doing Huddles, which principles we considered while developing them, and how we run them as a design team. Formal design critique is typically a way for a group of designers to get together and give constructive feedback on each other’s work. Formal critique predates my tenure at Trello; the team has been doing it for almost four years. For the majority of that time, the team used an opt-in model, where designers would schedule critique when they needed it. Over time, an interesting phenomenon developed: Designers weren’t opting in as much. It’s not so surprising. Think about the word “critique.” It’s easy to interpret it as criticism. Who wants to get criticized in public, at work? And any designer can attest that even a well-run critique that’s truly constructive still feels hard in the moment—it's natural to feel defensive or frustrated that others are missing context. Considering this aversion, we wanted to rethink critique for our team. We wanted our team to see critique as a practice that builds designers up and helps us reach heights we couldn’t reach without a team behind us. We’ve developed Huddles with great intention, to ensure that they suit our remote context and mitigate some of the pitfalls we humans fall into when we get together and talk. Attentional bias: We naturally give more attention to the most extroverted, loudest, or most senior people in a meeting. However, social science tells us that the most successful, engaged teams share meeting time equally, extroverts and introverts alike. Grandstanding: The larger a meeting gets, the higher the social stakes. As the stakes rise, we naturally shift our intention from being helpful to being impressive. This dynamic can transform a meeting into a performance piece, which isn’t a particularly productive use of time. Groupthink: Humans have a tendency to agree with each other when we get together, even if the resulting consensus isn’t a realistic representation of what we’re discussing. Groupthink overrides independent critical thinking. Social cohesion: In a remote context, social cohesion happens slower and less organically than when we’re in person. It takes teams more time to build the trust, camaraderie, and rapport that are foundational to creating a psychologically safe environment where honest dialogue can happen. For our remote team, we have to be intentional and proactive in making social cohesion happen. 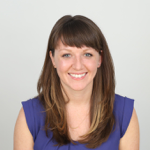 Social cues: The non-verbal signals we get over video calls are significantly diluted. As a result, we often unintentionally talk over each other or miss social cues we would otherwise pick up in person. Focus on the presenter: In each Huddle, we explicitly talk about the fact that the group should be focused on helping the presenter improve their work. And we make it clear that it’s up to the presenter to decide what feedback they’ll incorporate post-Huddle. Structured facilitation: We have a facilitator and a common structure for each Huddle. To combat groupthink, the structure includes time for each person to think and write ideas silently before sharing. We’ve also found that facilitation and structure reduce those awkward moments when we talk over each other, or misinterpret social cues. Conversational turn-taking: For most of the time during a Huddle, designers are taking turns sharing their ideas and feedback. We use Mural and move through a template that sorts feedback into positives, negatives, questions, and ideas. This kind of conversational turn-taking balances out attentional bias and helps overcome missed social cues. Session cadence: Huddle groups meet frequently enough and for enough weeks that they establish camaraderie as a group. For us, this looks like a weekly meeting for six consecutive weeks, at which point we mix up teams. The rotation over time builds rapport across the whole team and gives team members a chance to grow in their facilitation skills. Small groups: We keep Huddle groups to six designers max, to keep grandstanding to a minimum and to create stronger connections between designers. Whether the Huddle will focus on a concept (something with visual assets) or a problem (something in research or problem phase, pre-visualization). A brief explanation of the concept or problem and why they’re working on it. How it will impact other teams or parts of Trello. The stage the work is at in the project. What types of feedback they’re looking for. Open questions to focus on during the session. The presenter is the decider: The presenter should feel free to take what’s helpful, leave what’s not, and not feel pressure to implement anything specific. Stay in bounds: Try to give feedback within the bounds of the feedback type the presenter asked for while setting context. Default to questions: Questions open up conversation, instead of closing in on a specific suggestion. Keep your microphone on: So the presenter doesn't feel alone while sharing. The presenter talks through the context of their concept or problem and then presents their work. This could look like sharing their screen while they walk through a prototype or design file, asking the group to look through design assets independently, or just explaining the problem they’re facing. Each person claims a sticky note color and takes notes in their section of the Mural. 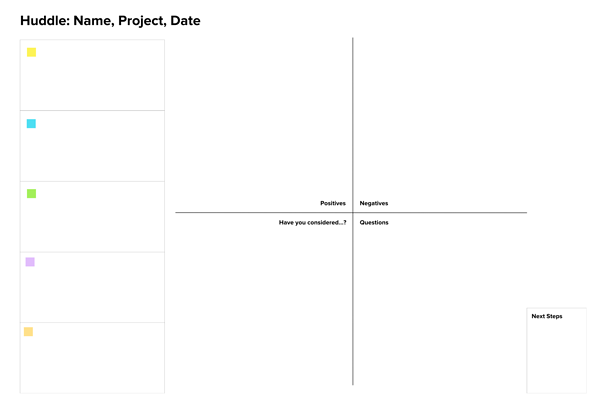 The group takes another 5-10 minutes to write down any other notes in silence and then they drag their notes into the appropriate quadrant: Positives, Negatives, Questions, or Have you considered? This final category are ideas, but posed as questions also. The presenter starts with the quadrant of their choice in the Mural and asks each person in the group to explain their sticky notes. The presenter can jump in to answer questions or give context. 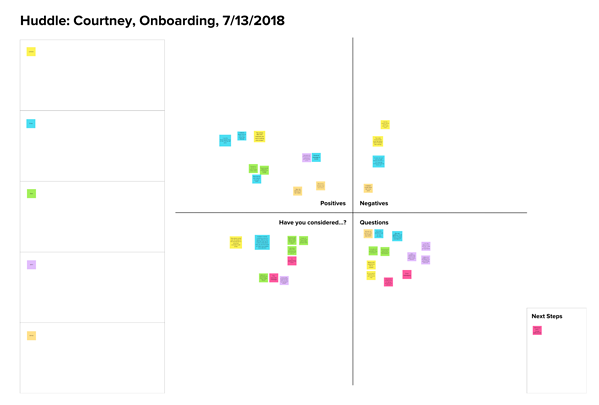 Since the session is explicitly for the presenter’s benefit, they move the group around the quadrants and can spend time wherever it’s most valuable. The facilitator’s role is to keep things approximately on time. The presenter often shares how the session has been helpful to them and the facilitator again thanks everyone for taking time to support their teammate. There you have it! This is the latest and greatest of our thinking around Huddles. Trello designers have also started using Huddles to get feedback from their cross-functional teams. Those teams say that Huddles have helped them make better design decisions and bring team members together. We’re continuing to collect feedback from the team to improve how they work so if you try out a Huddle for yourself, we’d love to hear your thoughts! Find us on Twitter (@trello) or write in to support@trello.com.